In many states, voters will be asked to weigh in on a slew of measures and proposals, whether comprehensible or not. When voters finally get to the polls tomorrow, they may run into more than a big crowd. Voters in many states will be facing a slew of confusing measures and often overly long ballots. Early voters in Florida have already reported long lines. One potential reason for the delays: Voters have to wade through 11, wordy, constitutional amendments. Backed by Republican state lawmakers, the proposed amendments among other things seek to prohibit requiring individuals or businesses to purchase or provide health care as specified under the Affordable Care Act, prohibit public funding for abortion except in certain circumstances, and allow public funding for religious organizations. Unlike citizen-led ballot initiatives, which require court approval and are bound to a mere 75 words, legislative amendments face no such restrictions – in either word length or quantity. The lengthiest amendment this year – one proposing property tax breaks for the owners of second homes and vacation homes plus businesses that own commercial property – is 640 words. The second-longest amendment, which proposes giving legislators the authority to confirm Florida Supreme Court justices, trails closely behind at a slim 585 words. 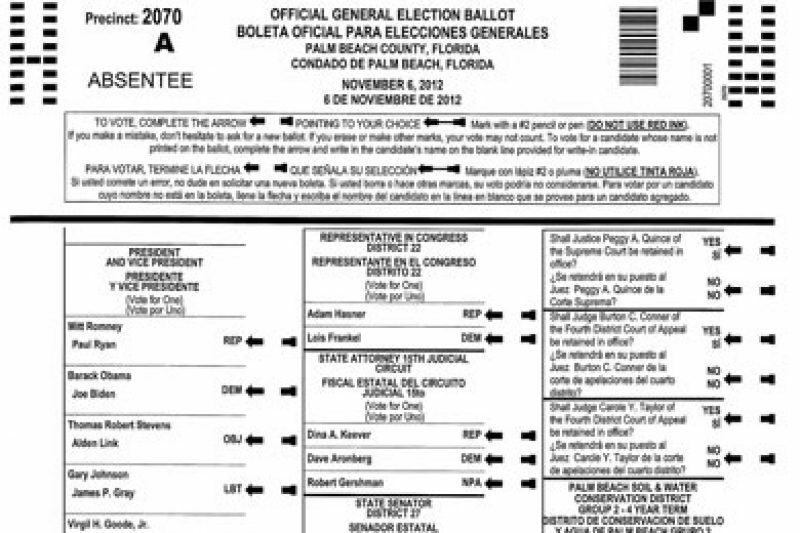 In Miami-Dade County, a sample ballot for the general election runs 12 pages. The Miami Herald has reported that each ballot is taking up to 70 seconds to print when elections officials give it to voters. Confused Florida voters have bombarded citizens’ groups like the League of Women Voters with a record number of calls for help with cutting through the jargon. Some observers also complain that the amendments are not clearly written. The error is estimated to have affected about 35,000 absentee ballots in Palm Beach County, seat of the infamous “butterfly ballot” controversy from the 2000 presidential race. About 27,000 of these flawed absentee ballots have already been turned in. But voting “yes” on the measure actually leaves the new districts as they are. Voting “no” overturns them. Of course, voters in California and elsewhere are far more accustomed to ballot initiatives in which voting “yes” supports something new, while voting “no” rejects it – the mirror opposite of the referendum. “There’s a real danger here that voters attempting to preserve the status quo will unintentionally trigger an entirely new line-drawing process,” said Dan Schnur, director of the Jesse M. Unruh Institute of Politics at the University of Southern California. To complicate matters, Proposition 40’s supporters have since abandoned the campaign to get voters to reject the new districts. They’ve since shifted focus to getting Republican victories in the new seats. The measure nevertheless remains on the ballot, where it is listed last among 11 measures. A confused – and by this point, fatigued – voter lacking particularly strong feelings toward the referendum may “tend to vote no, just out of caution,” says Schnur. If enough people voted ‘no,’ what might be the result? Potentially even more confusion. The California Supreme Court has already upheld the new district lines, but it could still end up ordering what the proposition calls for: court-appointed special officials to redraw the district lines. That would begin the arduous and tumultuous redistricting process all over again. Two seemingly similar tax initiatives on California’s ballot aim to achieve the same thing: provide more funding of public schools and early childhood education. Backed by Democratic Gov. Jerry Brown, Proposition 30 would temporarily raise the state sales tax by 0.25 percent and income tax for individuals making more than $250,000. Eighty-nine percent of that would be funneled to K-12 schools and 11 percent to community colleges. Meanwhile, Proposition 38, bankrolled by powerful civil rights attorney Molly Munger, would generate revenue for education funding, but by raising income tax for individuals making as low as $7,500 in taxable earnings. Supporters behind the two measures have thrown their weight behind discrediting the other initiative. That means that voters facing near-identical choices on the ballot could either vote to reject both initiatives to simply avoid a close choice or be so divided in their votes they’ll set up a potential court fight over the winning initiative. “We have this odd spectacle of two ballot measures designed to raise taxes for public schools attacking each other,” said USC’s Schnur. If both tax measures happen to receive more than a 50 percent vote, the initiative with the higher number of votes will take effect – but only in areas in which the measures overlap. “Ultimately, if both pass, it would be up to the courts to decide how the money is allocated,” said Schnur. Yet Amendment 4 actually reaffirms other segregationist-era language in the state Constitution. The proposed amendment would remove the 1901 Jim Crow-era passage, “separate schools shall be provided for white and colored children.” Yet it restates another education-related section meant to defy the 1954 U.S. Supreme Court ruling Brown v. Board of Education, which struck down as unconstitutional segregation in the nation’s schools. Intended to thwart the integration of Alabama’s schools, the 1956 measure was held unconstitutional by an Alabama state judge in 1991. One potential reason the old language was included: In 2004, Alabama voters actually narrowly defeated an amendment that would have lifted both the 1901 and 1956 passages from the state Constitution. The state’s black politicians, Democrats and the largest teachers’ association are urging voters to block this year’s amendment.